Loyal Primus fans were waiting out in the rain along 69th Street well before the doors opened just to grab a spot along the rail in the pit or their preferred seat in the house. 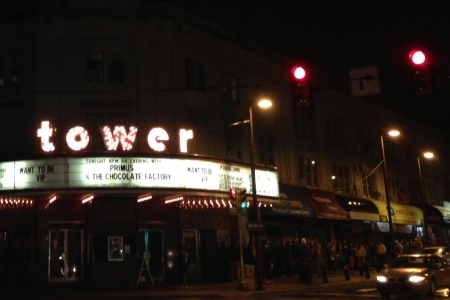 The Tower Theater just recently pulled more seats to accommodate a larger pit for general admission shows. Most of the talk outside before the show was about we might see. It was billed as 'Primus and the Chocolate Factory' on the marquee and expectations were high. What would the staging be like? How will the record translate live? 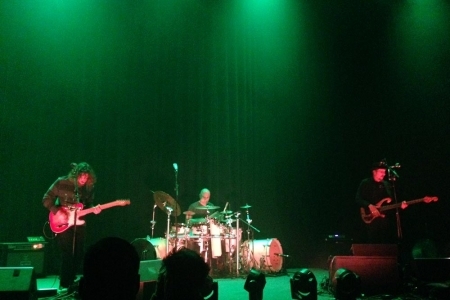 Many were excited to see the original lineup back for the first time. It was a bonus and a surprise when the crowd learned there would be two sets. The first would be a regular Primus set. The second would be the Wonka set. The first set took place with a bare setup, a black back drop and the band towards the front of the stage. They went on at 8:15 and played a hour. Claypool welcomed drummer Alexander back saying, “Look, Tim's alive.” The trio didn't seem to have missed a beat. Les was mesmerizing on bass as usual, often breaking into his signature trot. Lalonde's guitar was searing at times. Alexander's playing was tight and locked in. Nineteen years was erased on that stage Wednesday night. The general admission crowd returned the energy, surging, dancing, slamming into each other, guiding the occasion crowd surfer over the railing. Many were getting it all out knowing the second set would be mellower. The curtain rose on the second set to reveal an elaborately decorated stage and the band donning appropriate costumes. 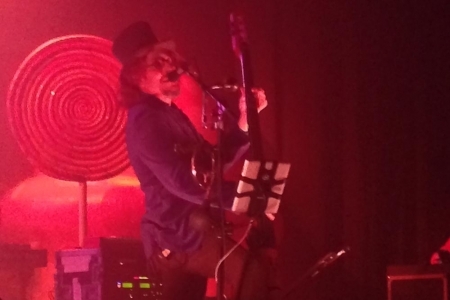 (Les with a masquerade mask which he traded for Wonka's hat, Lalonde in a older suit, and Alexander in the Wonkavision white jumpsuit) They were joined on stage by Mike Dillion on marimba and vibraphone and Sam Bass on cello. There was a two-story high inflatable mushroom to the left and giant lollypops to the right. Throughout the stage there were large candy canes, mushrooms, umbrellas, giant gumdrops, and hard candies. You could say it was a psychedelic version of Wonka's candy room. 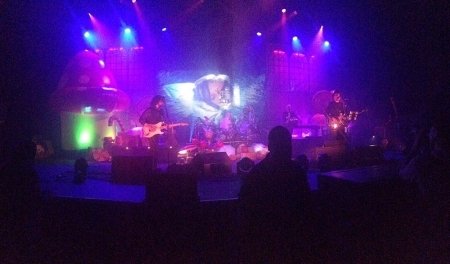 The large video screen behind the band showed psychedelic video edits of selected scenes from the movie that corresponded with each piece they were playing. It was an aural and visual delight, as much as I expected and more. 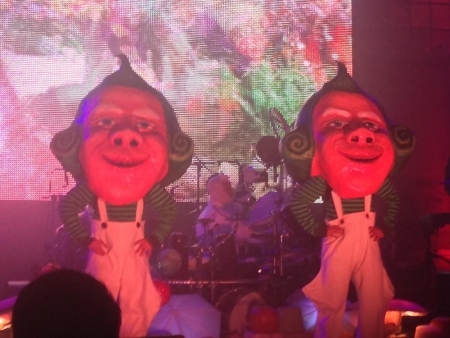 For the Oompa Loompa sections, two costumed stagehands wearing striped socks, lederhosen, and giant paper mache heads looking like natives of Loompaland entered from opposite sides of the stage and did their little dance. The album and therefore the show was a revue of the movie and follow out the basic storyline through. At the end we were left with the Wonkavator flying over town and the keys to the factory in Charlie's hand.